The Vault Table Trainer VT Block features four 36" wide x 43" long blocks and will adjust in increments of 21", 39.5", 44.5", 48" and 53". This Gymnastics VT Block mat will accommodate all beginners, women's and men's heights and is sold as a complete set. The VT Base Block is a 2 section block which will convert from a 21" height to 39.5" height. The 21" height allows the younger gymnast to start training round-off entry vaults. Adding the women's block will equal 48" and with the men's block will equal 53". 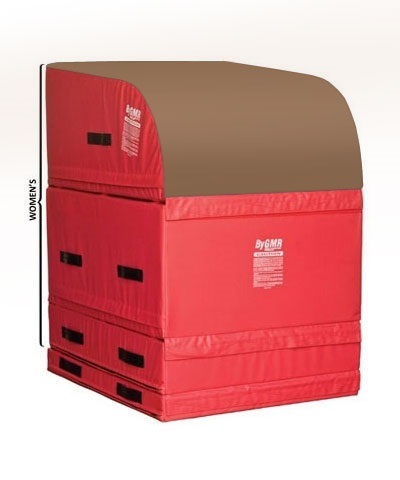 The VT Block is made of high density polyurethane foam and covered in 18oz coated fabric. The top is covered in blue non-slip 18oz coated vinyl. All sections will secure with hook and loop fasteners and will connect to the vault runway or carpet bonded foam. Must be shipped motor freight. Please use the quote button to request freight charges.